I purchased a RS21 it has done nothing but break down about 7 times each time losing all the frozen food. Samsung say the problem is fixed after every visit. You only have to look on their website to see the problems they have had with this model. Now they have sent letter saying it could catch on fire. The RS21 was not fit for purpose they should replace them or refund the £800 paid. They offer no apology nothing I will never buy another Samsung item. 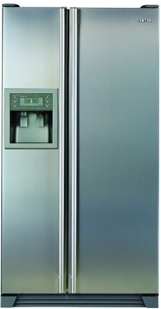 We have one of the above fridges, and contacted Samsung agents, whom have made two appointments, and failed to turn up, so the fridges surel7y cannot be that dangerous. Brian: That’s poor service, but there’s no way a manufacturer would recall a product under such circumstances unless it was a serious issue. I have contacted Comet who said I had to contact Samsung. I contacted Samsung (0800 9880123 line only for items at risk) and have refused their repair. They will let me know within 7 days if they will replace the item. Tony: If you want it repairing under guarantee you contact the manufacturer. If you want to claim compensation because you believe the fridge has been unfit for purpose or hasn’t been of good enough quality you have to deal with Comet. Most if not all retailers are likely to tell you there’s nothing they can do so you may well have to take them to the small claims court and or get advice from the Consumer Advice centres. If Samsung want to compensate you or swap the appliance out of consideration of retaining customer good will they can do but they have no obligation to under the sale of Goods Act. If you went down to the retailer and started shouting in the shop im sure they would come round to your way of thinking. Possibly, but they might also just call security and have you thrown out, and then become increasingly intransigent making you have to fight even harder. I suppose it depends on personalities involved but being polite but firm will yield better results in most cases I’m sure. I know a lot of people in customer services and if a customer becomes aggressive they will just have nothing to do with them and become deliberately obstinate and unhelpful. Most companies have established policies in place that give their employees the right to just hang up the phone or walk away from a customer and refuse to speak to them again if they are sworn at or otherwise abused and they will not get into trouble for it. Having said that if people were kicking off all the time they probably would think a bit more about just fobbing people off when the law says they have a legitimate claim. MINE RS21 decided to go on fire while we were on holidays, lucky the house didnt burn down, they are offering me a new fridge, needless to say my confidence is shattered and I would prefer a cash settlement and go buy a proper fridge like a bosch. Rob: If you’ve had it less than 6 years (or 5 in Scotland) I think the sale of goods act entitles you to a full refund from the retailer if that’s what you prefer because it was sold with an inerrant fault. They may be able to knock something off to account for the usage you’ve had from it before the fault, although you may be able to threaten to sue for compensation for the stress and hassle caused by having it catch fire if they did and you thought it unreasonable under the circumstances. I contacted Samsung via the online form with my model/serial numbers and they called me back a couple of days later to tell me that it had been passed to a local agency who would contact me. A very helpful and friendly local company contacted me and the engineer visited this morning. All affected parts replaced free of charge. Thank you to the local company and Samsung for resolving this issue. There you go – a positive story for a change. I bought my RS21 in 2003 and it lasted until mid 2008 when the well documented fault occurred. I called Samsung, their engineering dept called me back and arranged for a local company to repair – all within a couple of days and free of charge. All very good, left me feeling that Samsung is the brand to buy. The repaired unit has now failed (June 2010) with the same fault, Samsung sent the engineer who said the charge would be £190 or £300 if the fan motor had failed. Recontacted Samsung since it is a similar failure in their replacement unit – they’re not interested. I will repair myself, replacement unit c. £80. Annoyed that they seem content the replacement unit should last less than two years, but appreciate their position that the fridge is now approaching seven years old. Mind you ‘in the old days’ they lasted a fair bit longer than that! I suspect that I’ve been lucky it’s lasted this long, so if I have to replace it, I probably won’t buy another Samsung. Comet visited to complete modification, when they had finished and gone I went to wash the top and found it broken, Comet called out again, they could not gain part and taped it, called out again as the fridge now not getting cold and wanted the rehousing changed. Comet now say that they can do nothing as they can not get a replacement, I will have to phone Samsung and guess what they say not their problem phone comet, any ideas. Of course it isn’t Samsung’s problem Pam, you shouldn’t have to ring anyone. Regarding the damage, if it can’t be put right obviously whoever caused it is responsible for compensation. Regarding any fault on the appliance it’s only Comet who are responsible under the sale of goods act. Even if it is a design fault the manufacture isn’t responsible it’s the people you bought it from. It sounds unfair and it is to a point but that’s how it is. It’s up to them to counter claim from who they bought it from. I too have the above problem with my Samsung RS21nCSV fridge freezer and have never been informed by Samsung about this very real danger of a possible fire hazard. I only found out about it because my fridge developed the problem mentioned above. I phoned samsung and they are in the process of fixing the problem. As the fix may only last two years would it be better to try and get a replacement? I have a Samsung RSE8DZAS purchased about 2.5 yrs ago. I’ve just found out about this recall which applies to my model (though just as a precautionary as it’s not an RS21/RS60), and I wondered if this is likely to be the cause of the problem that the FF has developed over the last few days. About a week ago, despite the fridge showing 3 degrees, lots of the food in the fridge had frozen. After a couple of days, it seemed to sort itself out but then yesterday I noticed that the fridge was now 10 degrees. After a couple of hours it had returned to normal, but this morning it’s back at 10 degrees. I’ve not noticed anything abnormal about the FF; there’s not been any notable increase in fan noise that I’ve noticed. Should I just wait for Samsung to get back in touch with my to arrange their visit (which I will obviously still do anyway), or is this likely to be an unrelated problem that I need to go ahead and get repaired myself? If it’s not related to the RS21 fault has anyone any suggestions what the problem is likely to be? Emily, I’d suggest you give Samsung Customer Service a call if you’ve never had the FF looked at before – our fridge died over Christmas (see 2 posts above). Samsung sent out an engineer who ordered a whole new heater for it and as it was covered by the recall, it didn’t cost anything (though we did have to wait a week or so for the heater to be ordered in). If your FF has never been modded to correct the fault, it could be the cause of the constantly blowing fuses so it’s at least worth while making a note of the serial number and ringing Samsung before you pay for an independent repair. There is a web page for the recall that I used originally which says someone will get in touch with you and tells you not to phone, but I don’t think this is monitored anymore because after a few days of hearing nothing I rang and they didn’t have any record of my contact via the web, so I’d advise you phone them rather than anything else. emily: As Neil said, if you haven’t had the modification done already (and assuming your particular model is affected) it may be better to get the manufacturer in. Check your serial number using the link to Samsung I provided in my article above. My Samsung RS21 has broken down twice. Apparently there’s a problem with the cooling system and they sent a local engineer out to replace it free of charge and he said it would be fine……it’s gone again!! I’m hoping they’ll either replace it once more or replace my fridge freezer, i shall got to Watchdog if i get no joy! Hello Dawn: Your fault may be related to this recall as the fault can cause “sparking” which can of course trip the electrics. If you want to pursue the inherent manufacturing fault complaint you need to take it up with who you bought it from if whirlpool have not helped. Only the person you bought it from is responsible under the sale of goods act. You have a time limit of 6 years (5 in Scotland) to bring such a claim and would probably need to go to a consumer group or the small claims court if the retailer fobs you off, which most do, most of the time.